Alive and Well, but Very Busy! I just wanted to drop a note to let everyone know that I am alive and still working on this blog. This year I’m lucky enough to attend VMworld in Las Vegas. Its been a busy few weeks planning my event schedule, and meetings with vendors and fellow Virtualization Enthusiast. I will do my best to post each night about my daily events. I know things have been quiet around here. I have also been settling into my new role and starting to get involved in some projects, including a complete migration to ESXi on vSphere 4.1U1. Now that I’m getting settled in, I plan on putting more time back into this blog to continue to share knowledge and the experiences I deal with during my current and future projects. I’ll also be absorbing as much info as I can at VMworld so I can pass on some of the knowledge and all the experiences I have at this amazing event. Thanks again for your continued support of this endeavor. I wanted to put together a quick post to let everyone know where I’ve been and what has been going on. Its been over a month since I’ve added any new content to the site, and while I have a lot of great things coming, they are being put second to some recent developments. The reason for my lack of additions to the site is that I have been offered and accepted a position with TD Bank, N.A. as a Technical Engineer III for Virtualization Engineering. Over the next month, as my old company completes the merger and conversion of systems to our new company, I will transform and transition into my new role. That said, the conversion activities have gobbled up a large amount of my time between projects, travel and still trying to keep things together. I am very excited about my new role, and please to know that an entire group to head virtualization in the US was created specifically for myself and my colleagues to build and tie together the direction of that technology and move it forward. Things may be bleak around here until I get through conversion and things settle down. I do have a lot of content in the works, both of technical and conceptual natures that I hope to share shortly. We all know the struggles of balancing work, our personal lives and relationships, as well as our hobbies, such as my blog. I do want everyone to know I do remain committed to keeping this project going and add as much to the virtualization community as I can. I sure know I get a lot from others in the community and its nice to give back. On a more exciting note, I also received word that I will be attending VMworld 2011 in Las Vegas, NV this year. I am looking forward to the huge amount of information and fun activities that come along with great events like these. Lastly, I wanted to thank everyone who has taken the time to read and respond to the content I post here. This start out as a place for me to store my thoughts on many topics, as well as resolutions to problems I had found. It has since grown faster than I thought it would, with weekly visits averaging around roughly 150. I am also getting involved in discussions on other blogs and have since met a lot of very knowledgeable people, both through the digital and the real world. I look forward to continuing to grow those relationships, as well as meeting many new people. Microsoft Can’t Quite Invade VMworlds; Attacks from Outside! While its no POKER CHIP FIASCO, this and other recent events, such as the Dell & HP bidding war for 3PAR, make it evident that multiple companies are going all in on cloud computing, and will do whatever it takes to win your business. On the upside, it makes you feel good to be on the ground level of this technological tidal wave. 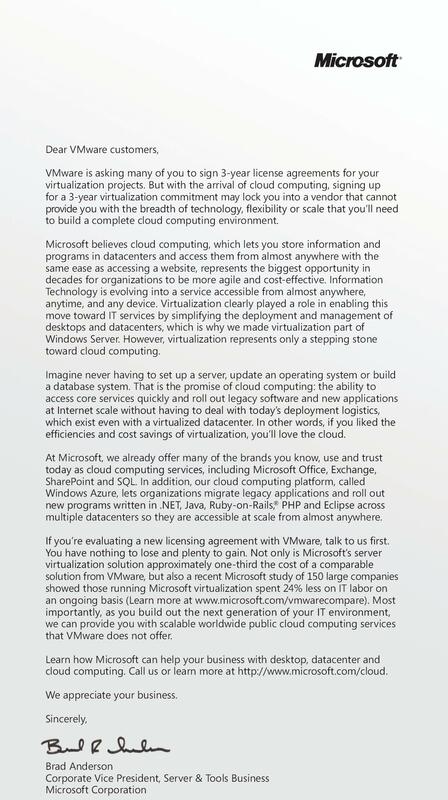 Today is day two of VMworlds and VMware’s Keynote speech was atop the list of things to see. A majority of the info has already been rehashed all over blogs so I wont go into details, but I did want to touch on a major point that was mentioned. Paul Martiz, President and CEO of VMware, announced that for the first time ever, the number of virtual machines has surpassed the number of physical machines. This is huge news in the field is systems administration and engineering. This means the tipping point has been reached, where virtualization is no longer just a cutting edge technology, but the norm. Admins and engineers will now be required to know the ins and outs of virtualization and shift from the standard practices of physical environments. The VCP will become, and is becoming, a more common certification, and one they may even be required. The impact of this though, is that admins and engineers will require more training and knowledge than ever before, because while physical servers just require systems to be racked and OSes installed, virtual environemnts require knowledge and planning of storage, networking and scalability and capacity planning. All and all, this is a good thing and I for one and glad to see this technology that we all enjoy thriving so well. I hope to continue to see if and maybe even by 2012, see the numbers be 75%/25% for virtual to physical systems.